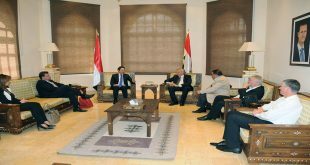 Damascus, SANA- Prime Minister Imad Khamis affirmed the need to work on a systematic vision and an organized framework in order to achieve a qualitative leap in tourism sector which is a major component of the national economy. Khamis remarks came during a meeting at the Tourism Ministry, in which the participants agreed on reactivating the National Tourism Plan according to advanced outputs that address the challenges related to developing this sector. 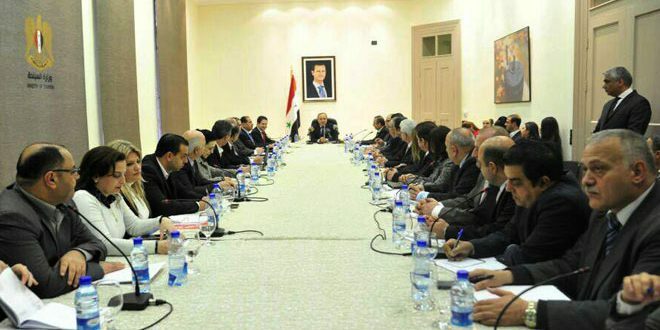 They also adopted a comprehensive plan for the promotion of tourism, enhancing the tourism investment with friendly countries and Syrian expats, in addition to speeding up the tourism investment law and setting up a real tourist map for all provinces that includes future projects in each province. The participants decided to establish a database for all tourism projects, an executive program and an agenda for the return of all facilities damaged by terrorism to work in the public and private sectors and to provide all necessary facilitations, including easing administrative procedures and providing loans.